Admittedly plastic welding is a fabrication technique that is going to be attempted by few “Do-it-yourselfers”. Plastic welding will require the purchase of special tools and filaments which are not always easy to come by. In addition, since most plastic welding is done by specialists, it is difficult to get fabrication tips from plastics distributors or manufacturers. You’re likely going to have to search the internet for ideas and while we cannot vouch for the tips, YouTube seems to have several good videos to get you started off right. We found a great little video on YouTube by user “Make:” which in just three minutes (before credits) gives all sorts of great tips for the DIYer using acrylic in their applications. It starts off with a good point that not everyone knows: acrylic comes in both cast and extruded forms. Yes, they have differences that are important in an application. Yes, there is a difference in cost. Other important tips include how to thermoform, glue, and most importantly – drill, the plastic. Drilling is especially important as the plastic can crack easily, so using lubrication and a soft touch is essential to prevent a wasted part. It will help you answer some questions you didn’t even know to ask prior to diving in: do you have all the materials you need? How are you planning to smooth the edges of the acrylic? Are you a “DIYer” who makes plastic bearings at home or perhaps looking into doing some? Not sure how to calculate a press fit or a running clearance for your bearings? 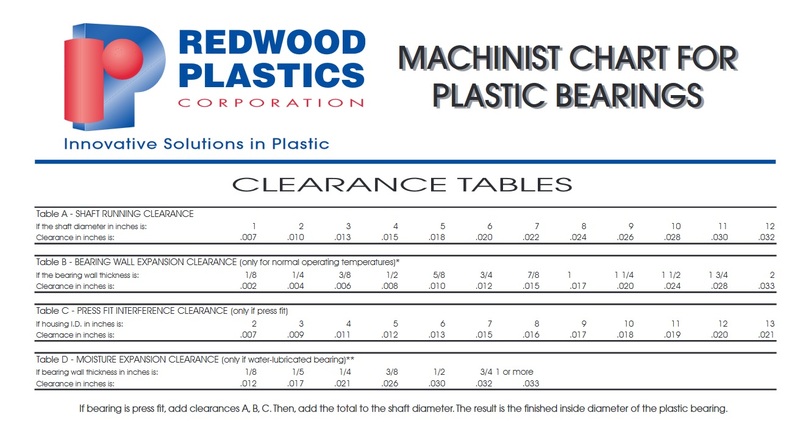 Fortunately there is a useful tool available from Redwood Plastics available on their website: the machinist chart for plastic bearings found here. This chart provides valuable information for bearing manufacturing using Redco 750 or Redco nylon bearing materials. While many in the DIY crowd like to use UHMW polyethylene for everything, including bearings, this is not a good bearing material and has large and variable tolerances. 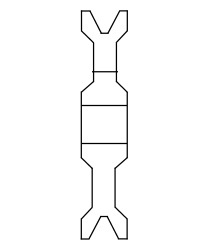 The bearing chart is not intended to be used for UHMW bearings. Acetal is similar to nylon and therefore nylon’s values can be substituted directly. The question comes up a lot in the DIY community: “I am planning to make _______ so what plastic do I need?” The good news is selecting a plastic for your application is very similar to how heavy industry would select a plastic for their projects. You need to select a plastic based on certain properties it gives you, not some sort of bias to what you “heard” worked – and especially not based on color! -Anywhere a “frame” is needed. We wanted to bring up something amateur plastic project enthusiasts and “Do-It-Yourselfers” often don’t consider until something goes wrong: the weathering of plastic. This was inspired by the a recent visit from a “diy’er” Jason, a hunter. Jason wanted to show us a table he built for processing his game. It was a homemade outdoor table with a white plastic surface likely natural or virgin-white HDPE or UHMW polyethylene. The surface was discolored and had numerous small cracks where Jason (rightfully) was concerned about bacteria growing in the cracks but even more so, he was curious on what caused the plastic to degrade. The answer for Jason and the culprit with many plastics is UV (ultra violet light or sun) exposure. The chemistry would take to long to explain but suffice to say the sun has damaging effects on plastic. Many plastics become more brittle and crack while others discolor, usually by becoming yellow. If you’ve ever been to an aircraft museum and seen the yellow tinted plastic (polycarbonate) canopies on aircraft? That’s from weathering and UV-exposure. If you look, very closely, at those canopies you’ll see subtle cracks that create a type of haze obscuring vision, as in the picture below. In most plastic applications for home machinists and project enthusiasts the UV exposure is more of an annoyance than anything. We recently had a sailboat owner frustrated with the discoloration of his polycarbonate hatches he made: the same issue with those aircraft canopies. The most important thing for your project is to figure out of there would be a safety issue caused by a part weathering. In the case of Jason the hunter the cracks on his table might harbor bacteria but since the meats would eventually be cooked (and raw meat has lots of bacteria anyways) this probably isn’t a critical issue. However, in another application – such as the increasingly common homemade roller coasters – the failure of a part, such as a wheel, could be very dangerous. If you want UV protection there is some good news. Most plastics can be procured in UV-stabilized versions. The problem is these versions are more expensive and sometimes prohibitively more expensive if the material needs to be shipped in on a special order. In the competitive world of plastic distribution there simply isn’t margin or warehouse space to stock the UV-stabilized version of every plastic. The other thing you need to realize is that UV-stabilization in plastics isn’t permanent, it just buys you time – usually no visible degradation over 10 years – but the plastic will eventually lose its UV-stabilizing properties and degrade. The point of this article is to get you thinking and remember to consider on your next project if weathering is a concern. And for those of you with weathered plastic in your applications? Well now you know why! For more information, contact Redwood Plastics.